24” X 30” X 2"
Geronimo died a prisoner of war in 1909, never aloud to return to his homeland. I painted him as an elder, wise, maybe too wise to what was happening in the world as he had seen it and watched it unfold. Facing his fear and standing in his courage his spirit remains deep behind the wrinkles of the ages. His eyes reflect the knowing of many thousands of years. And compassion reigns strong in his badge of courage as his spirit flies free with the winged ones. I was born where there were no enclosures." Nan Tan Nupan – Gray wolf Chief, Geronimo had magical powers as a medicine man, advisor to chiefs both spiritually and intellectually. He could see into the future, walk without creating footprints and had an alleged immunity to bullets. Geronimo embodied the very essence of the Apache, Courage in the face of difficulty. He rebelled against the federal government for more than 25 years. In the end it took almost 10,000 men to track 16 warriors, 12 women and 6 children. 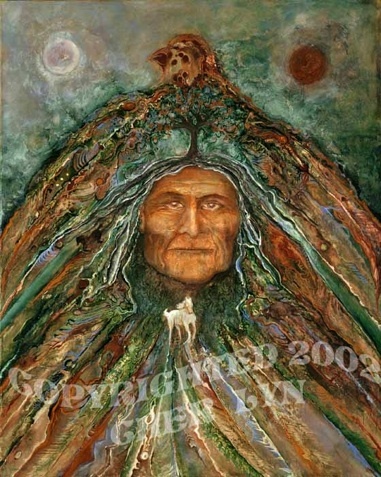 In the painting of “Geronimo Spirit Bird” he is cloak in the shelter of Mother Earth. A tree grows out of his crown, be a sign of his connectedness to both Heaven and Earth. The spirit bird is another level or dimension of that connection. The full moon and the dark moon correspond to the feminine cycle of nature in all life. The white horse, black horse, brown buffalo and red stag all bring in medicine and power, all relate to courage in the face of human insanity and greed. There is a term you’ve heard, “Indian brave,” life on the plains counting coup on painted ponies dressed in war paint and song; warriors would earn their badge of Courage. Geronimo’s wife and children were murdered, with his tribal life stripped from him in 1875, in his surrender he had to find a new kind of bravery, another level of Courage. Living in the white mans world, Geronimo had to use his strength and Courage to coexist in a foreign land with white mans ways. His Courage carried him through rodeos and presidents parades, souvenirs and charades. He fell deep into their ways, spirits pit of guilt and shame and died a prisoner of war, yet still a warrior of audacity, he played their game. 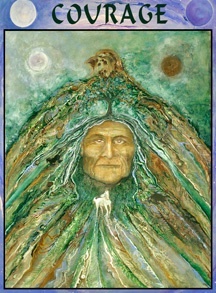 Geronimo’s spirit bird now flies free blessing all he sees on the blue road of courage. There is always a way to accomplish that which we seek. Yet the way is not always clear and we must walk through the doorway of illusion and fear. Life is filled with unforeseen challenges. The trait that will carry us through hard times is perseverance and courage. The seeking of courage is awakened through inner knowledge that all is possible and perfect in the mind of God. It isn’t necessarily a fearless state of mind, but a trained mind with courage… is action in spite of fear. To become one with the spirit of the Wind and the Tree, the horse or the buffalo is a transcendence of perceived human limitation that only the brave dare crossing. Whenever one attempts to go beyond the familiarity of their world the alarms of fear can prevent the exploration of the mystery. Yet it is often the unknown that shows us how to awaken dormant powers that exist within. Courage is one of the great human qualities that lead man to seeming impossible accomplishment.